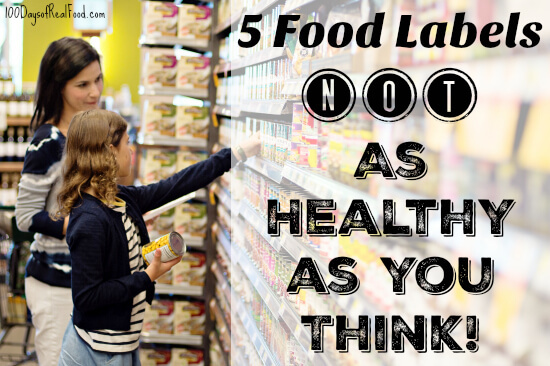 Home » Blog » 5 Food Labels Not as Healthy as You Think! There are so many mixed messages coming at us from food manufacturers these days, it’s no wonder things can be confusing at the grocery store. Here are some common ingredients and terms found on food labels that we are led to believe are healthy (by the people who stand to make a profit, mind you) and the reasons why that’s not always the case! Commonly touted as one of the good, “natural” sweetener alternatives, the truth about agave is finally coming to light. While the sap from the agave plant is a natural food that’s been around for centuries, that’s not what you’re buying off store shelves. The bottled up “agave nectar” (that seemed to explode out of nowhere over the last couple decades) is about as highly processed as high-fructose corn syrup (yikes!). Still on the topic of sugar, stevia – the green leaf you pick off your stevia herb plant – is no problem when it comes to natural sweeteners. But stevia, the packaged white powdery substance sold in stores these days? Think again. “Truvia (Coca-Cola’s branded stevia product) goes through about 40 steps to process the extract from the leaf, relying on chemicals like acetone, methanol, ethanol, acetonitrile, and isopropanol.” I don’t think it can get much more highly processed than that! You know what they say … if something sounds too good to be true, it probably is. Now “sugar-free” seems like it should be a healthy option, but this label is usually code for artificial sweeteners being used (one of the worst offenders in my opinion!). Now it’s no secret I like to avoid sugar, but I’d rather eat sugar – the real thing – over an artificial version any day! Dietary fat is not the enemy we once thought it was. (Sugar is really the one to be more worried about when it comes to our health!). “The low-fat craze caused millions, maybe tens of millions, of Americans actually to gain weight, because they were reaching for ‘low-fat’ but high-calorie carbs.” Not to mention removing the fat is going to result in a more highly processed product. So it’s time to embrace the real WHOLE foods we were meant to eat … in the right portions, of course. Gluten is a serious health issue for many, but gluten-free is starting to be viewed as healthy for everyone. I can’t tell you how many times someone has said to me, “Oh yeah, they have a lot of healthy choices now like gluten-free items.” NUH-UH! Gluten-free foods can be just as highly processed as the next guy. The only difference is they’re made from different grains (that don’t contain gluten). There are also gluten-free whole grains, which in my book, are no better than whole grains with gluten (such as wheat) – just different! Fat avoidance went overboard–obviously it isn’t good to eat a ton of butter every day either. But I know so many people who won’t eat nuts or avocados because they have fat. But those fats are healthy (in moderation, of course). Meanwhile, we now learn that the sugar industry was behind the fat campaign in order to take the public’s focus off sugar. Sugar in fruits that are chewed is fine, because of the fiber (i.e., beware of going overboard on orange juice, even if fresh-squeezed). The rest should be for special occasions only. And thank you for the gluten bit, too. In his book, Seeking Ultra, Rick Roll describes becoming vegetarian in order to become healthier, and says that just not eating meat isn’t enough–there are lots of meat-free junk foods. Same thing with gluten. Gluten-free does not equal healthy every time. I was wondering about Coconut sugar. Is it a real food? I have been trying to switch my family over to real food over the past 5 months and we’ve had success! Thanks for sharing all your research and your passion for healthy living! I want to know about coconut sugar too. I’m not a big sweets eater anyway, never have been, but some sort of sugar seems to be in nearly everything we eat! Hi there. Coconut sugar is not something Lisa uses but it is the sugar I choose if I need a granulated sugar. Here is a good article: https://authoritynutrition.com/coconut-sugar/. I’ve recently learned about date sugar. Any information regarding processing? Hi there. You might find this helpful: http://butterbeliever.com/how-to-make-your-own-date-sugar/. Great post but you should add “natural flavorings.” Read “The Dorito Effect” to learn about the 2200 or so man-made chemicals that technically are allowed to be called “natural flavorings” under food labeling laws. Thank you so much for highlighting the fact that “gluten free” isn’t all it’s cracked up to be. I am so tired of the misinformation about gluten! I make amazing bread using fresh ground flour and when people who think they are gluten sensitive eat it, they are FINE. The real culprit is enriched flour. When people stop eating gluten and feel better the real reason is usually because they’ve given up enriched flour. I can’t wait for the day when this is common knowledge. Thanks for starting the conversation! I’m so sad to see that agave is on this list, though I shouldn’t be surprised! What would you suggest as a healthy alternative? I put a tiny bit of agave on my granola and plain greek yogurt every morning to sweeten up the yogurt. There is a new “kid” in town, made from trees, touted to be the best new “all natural” sweetener. Available at the Bulk Barn in Canada. Do you have any info on this one? I put 1/2 teaspoon in my green smoothie each a.m. Always read your very informative newsletters — keep up the great work! It is not that new, at least in Europe it has been used for a very long time in chewing gum as a non-sugar sweetner. It is good for your teeth and does not raise insulin the same way as sugar and has pretty nice taste compared to many sweetners. I don’t know how refined it is but it is one of a few sweetners that does not cause stomach ache or tastes horrible. It is however very dangerous for dogs so be aware of this if you have a dog or are in contact with dogs regularily so you keep your can where it cannot be reached just in case. Truvias not good. SweetLeaf brand stevia powder is excellent and includes inulin, a PREbiotic. It’s amazing how much “convential health wisdom” has changed over the years! In college, I tried to cut out all fat. I made “fat free” cookie dough by just mixing up sugar, flour and water! Now that we know sugar is the real culprit in the current health crisis, I cringe when I remember that! (Not to mention that it wasn’t very good cookie dough. I never tried to bake it. I just ate it. Blech). I agree with you wholeheartedly about all of this, especially the artificial sweeteners. I’m just shocked that more people don’t know how dangerous they are and keep drinking their diet sodas! One other thing to mention is that foods that are “low fat” are often “high sugar.” If you take the same product off the shelf, and one is “regular” and the other is “low fat,” the low fat one will have more sugar almost every time. My thoughts were really wrong about all these terms, so this article is really interesting. I’ll share it! This is so useful! The next time I buy something I will definitely read the labels more carefully. I just bought your book last week. Love the ideas of eating real. Just don’t know how to start. I know you put suggestions, but finding the right meat willl be hard. Hi, Jane. Yes, it can be challenging especially when you are just getting started and learning the lay of the land. Don’t get caught up with being perfect. Just do your best, give it time, and you will find the resources that work for you.